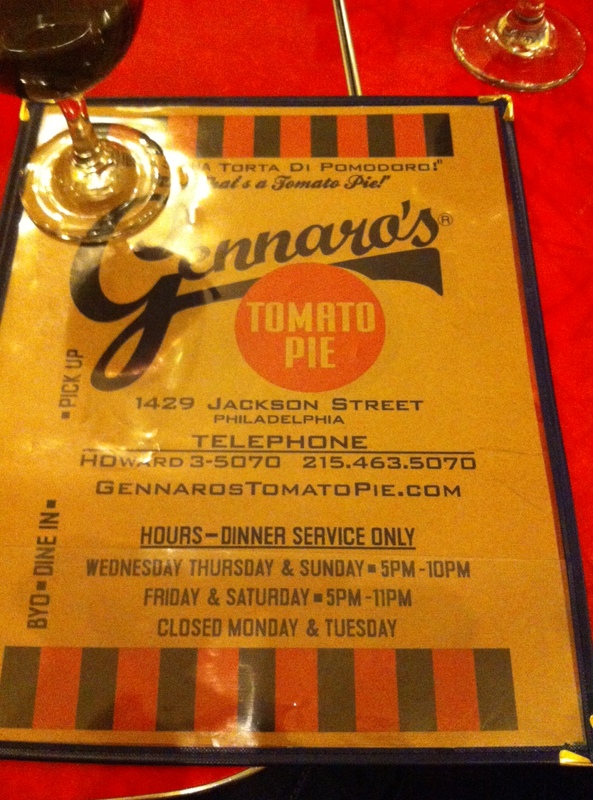 Gennaro’s Tomato Pie in South Philly!! I am a big fan of pizza. I love a thin crust made just right. My uncle has been the only person that could make the best pizza, that was until I went to Gennaro’s Tomato Pie with friends a couple of weeks ago. The owner comes from a family that knows a little something about pizza. Did you ever hear about Lombardi’s in New York? Well that was his family owned business. But with Gennaro’s he wanted to bring something different to the table. The pizza is a thin crust with a coal fired taste, cheese on the bottom and sauce drizzled on the top. Gennaro’s doesn’t only serve some amazing pizza, but they have other delicious appetizers from salads to desserts. I also love love the fact that they are BYOB. The decor is perfect as well. It’s like you’re walking into the 1940s with original pictures, and the radio is an actual radio show from the 1940s that plays some amazing standards.